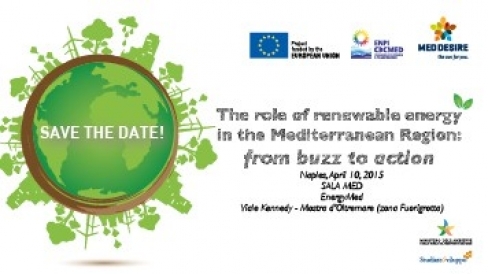 Next 10th of April, in the morning, during the annual Conference Exhibition on Renewable Sources and Energy Efficiency EnergyMed, the Italian Ministry for the Environment, Land and Sea promotes the Capitalization Event “The role of the renewable energy sources in the Mediterranean Region: from buzz to action” within the Project MED-DESIRE. The initiative aims at introducing to the private and public stakeholders the most recent financial, technological and regulatory developments on the renewable energy and energy efficiency issues underlining the opportunity and the barriers. The event is addressed to stakeholders and business sector and will include contributions of Institutional Representatives: Puglia Region – Italian Ministry for the Environment, Land and Sea - Tunisian National Agency for Energy Conservation (ANME) – Lebanese Center for Energy Conservation (LCEC) - International actors: United Nations Environment Programme - Division of Technology, Economics (UNEP - DTIE) – Scientific and Technical Experts: Center of Energetic, Environmental And Technological Investigations - Solar Platform of Almeria (CIEMAT – PSA), Italian National Agency for New Technologies, Energy and Sustainable Economic Development (ENEA), Politecnico of Milano, Hamburg Institut Research GmbH (HIR) – Stakeholders: Regional Center for Renewable Energy and Energy Efficiency (RECREEE), Solar Energy Development Association (SEDA) – Business sector Representatives from Egypt, Lebanon, Tunisia and Italy. Session I - Market stimulus instruments for the deployment of Solar technologies: financial mechanisms and solar obligations will be dedicated to the presentation of the work that Italian Ministry for the Environment, supported by the Southern Partners (ANME, LCEC, NREA) is doing on the market stimulus instruments in the framework of WP 6 – MED-DESIRE Project. Session II - Mediterranean distributed solar technology market: barriers, challenges and perspective will be devoted to the latest technological development on solar energy and the tools to remove barriers preventing distributed solar technology developed by Enea and Ciemat in the framework of the WP 5 – MED-DESIRE Project. At the end of the meeting a networking lunch will be held, with the participation of enterprises from Egypt, Lebanon and Tunisia. MED-DESIRE, co-funded by the European Union through the ENPI CBC MED Programme 2007-2013 for an amount of 4.192.000 Euro, aims at spreading energy efficiency, and in particular, solar energy across the Mediterranean area through the definition of innovative financial schemes and market stimulation tools. Its main priority is to remove barriers related to the legal, regulatory, economic and organizational framework of distributed solar energy technologies. MED-DESIRE partnership is composed by nine partners from five countries: Italy, Spain, Tunisia, Lebanon and Egypt. The partners involved in the strategic project are: Puglia Region - Regional Ministry for Economic Development - Industrial Research and Innovation Department (Lead Partner); the Italian Ministry for the Environment, Land and Sea; ENEA, the Italian National Agency for New Technologies, Energy and Sustainable Economic Development; the Andalusian Energy Agency (AAE); the Andalusian Institute of Technology (IAT); the Center of Energetic, Environmental And Technological Investigations - Solar Platform of Almeria (CIEMAT – PSA); the Tunisian National Agency for Energy Conservation (ANME); the Lebanese Center for Energy Conservation (LCEC) and the Egyptian New and Renewable Energy Authority (NREA).